The cuisine of Lithuania shares much with Polish cuisine, and Ashkenazi Jewish cuisine. Some dishes also show the influence of German culinary traditions, and there even some influences from the Karaite Jews of the Crimea! Bar�ciai - The Lithuanian version of borscht (beet soup). Chopped mushrooms are often added, and sometimes the soup may be blended with butter or sour cream. Bulviniu kukuliu sriuba - A soup made with minced potato shaped into balls and then boiled in milk. �altibar�ciai - A bright pink cold borscht soup, made using cooked or pickled beets and chopped vegetables. Often served with chopped hard-boiled eggs, sour cream and hot boiled potato. Sauerkraut soup - A soup made from sauerkraut. Often seasoned with bay leaves, carrots, onions and pork. Idaryti kiau�iniai - Hard boiled eggs, cut in half, stuffed and garnished. Idaryti pomidorai - Tomatoes, cut in half, stuffed and garnished. 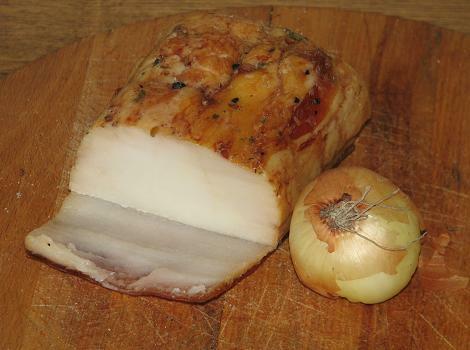 La�iniai - Pork underskin fat. Often eaten in sandwiches with unbuttered bread and onion. Pir�teliai prie alaus - Rolled up puff pastries. Bigos - A stew made from meat (various types may be used), sausage and cabbage. 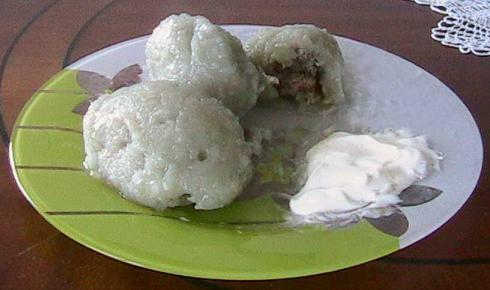 Cepelinai (also known as "did�kukuliai") - Often considered the Lithuanian national dish, cepelinai are potato dumplings stuffed with meat, cheese or mushrooms. They may be garnished with onion, sour cream, or spirgai (fried pork underskin fat). Kibinai - Pastry with mutton and onions. Kotletai - Ground meat patties, served with potato and a sauce. Lietiniai - Thin pancakes filled with ground meat and cheese with cinnamon, or with minced sauteed mushrooms. �altnosiukai - Dumplings with lingonberries. �a�lykai - Cubes of pork, marinated and cooked on a skewer over a fire. The Lithuanian version of shashlik. Skilandis (also known as "kindziukas") - Pig stomach, stuffed with ground meat and garlic, then smoked and matured. �emaiciu blynai - Potato pancakes. Kuciukai (also known as "�li�ikai") - Small baked rolls traditionally eaten on Christmas Eve (Lithuanian: Kucios). �akotis - A traditional Lithuanian cake, most often eaten at wedding and birthday celebrations. It is prepared by painting layers of batter on a rotating spit in a special oven, and has a distinctive spikey appearance. It may be served plain, or decorated with chocolate and flower ornaments. 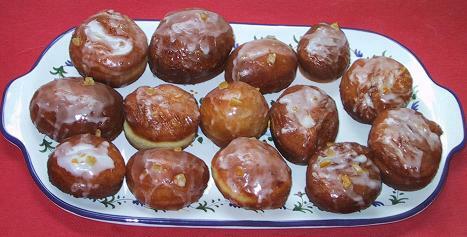 Spurgos - The Lithuanian version of donuts. �agareliai (sometimes known as "chrustai" or "krustai") - Twisted deep-fried pastries covered with powdered sugar.